Welcome to Wild Woody at Track 3 on the Strip in Branson. 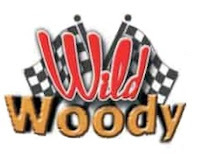 Wild Woody is one of three elevated go kart tracks in Branson and is currently the longest. The track starts with a series of giant helices going up. Here you can get a good idea of how tall the helices are. Once you get to the top, there is a left curve that takes you to the next section. The next section features a couple of camel back humps on the upper level of the track. Next you come around this swooping turn that takes you back towards the station. Then it is time to start another lap around the track. Wild Woody is our favorite of the three elevated tracks. It also seems to be everyone else's favorite too as it is always very busy.